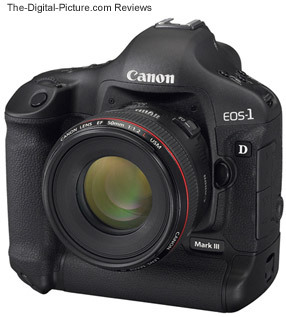 Note: The Canon EOS-1D Mark III has been replaced by the Canon EOS-1D Mark IV. 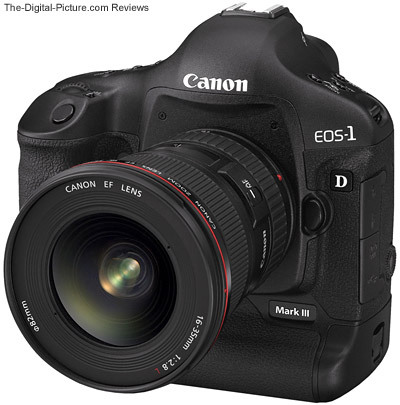 With the Canon EOS-1D Mark III, Canon takes us another big step forward in digital SLR technology. Redesigned from the ground up, the 1D III has so many new and improved features that it is hard to know where to start. Actually, it is easier to start with the only feature that is not best in class - The 1D Mark III does not have the 16.6mp resolution full frame sensor of the Canon EOS-1Ds Mark II. 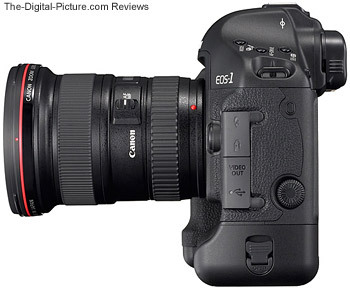 Otherwise, the 1D III is better in practically all regards. The 1D III makes my 1Ds II (from the 1D Mark II and 1D Mark II N era) feel very much like it is due for an update. I have been extremely happy with my 1Ds II - it is an awesome camera, so generating this feeling is not an easy accomplishment. But there are just so many new and improved features on the 1D III. 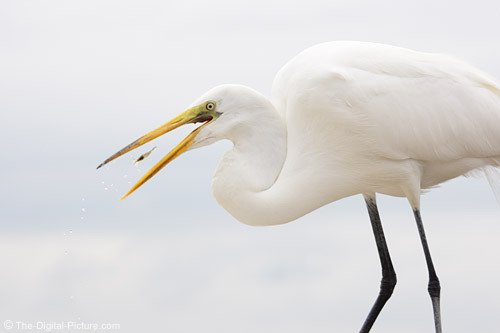 This frame of a tiny grass shrimp positioned so nicely in a Great Egret's open mouth came from the middle of a 10 fps series of shots. I'm not bad at capturing a moment with a single shot (it is the primary way I shoot on my 1Ds II), but 10 fps will usually get me the best shots. I love it. 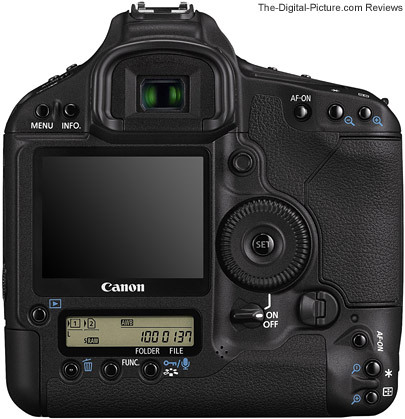 Canon 1D Mark III Digital SLR 10fps video (an animated jpg). What I don't love as much is the difficulty I am presented with when selecting keepers from my take-home. I suppose I could just keep all of them - but I usually am looking for the selects only. These 10 fps bursts deliver a huge number of images - generally 10 per second and generally around 30 in a sequence if I hold the shutter release down that long. These numbers change slightly or even dramatically based on the camera settings - especially if the aperture must be stopped down significantly (the aperture opens between each shot so AF can continue to work) or a slow shutter speed is selected (fast shutter speeds are generally used for catching action). The manual states that high ISO speeds greatly reduce the number of frames capturable in a burst, but the 1D3 still delivered a RAW 26 frame continous burst at ISO 3200. A Custom Function setting can be set to explicitly reduce the frame rate as desired. What helps out my keeper selection process a small amount is the 20% or so OOPF (Out of Perfect Focus) rate I get from the extremely fast-focusing AI Servo AF mode. Though not bad, it is not much (if any) better than from my Canon EOS-1Ds Mark II (which has the same AF system as the 1D II and 1D II N - but half the frame rate). Some of these shots could be kept - they are just not precisely in focus. A percentage of the OOPF shots are certainly self-caused (try tracking a bouncing rider's head on a galloping horse as they close in at near the 300mm f/2.8 IS's minimum focus distance), but the 1D III's AI Servo AF seems to simply get lost for short sets (3-5) during the burst. The rate is consistent - I am positive it is not all me. The shots the 1D III is capable of getting are impressive - I just think an extra 10% or so should be right on. No DSLR is perfect in this regard - and I didn't expect perfection from the 1D III. But, with a new flagship camera sporting a dedicated AF processing unit, I expected improved performance in this area. What is especially bad is the 60-70% AI Servo OOPF rate I get in a narrow set of circumstances. This is the same set of circumstance Rob Galbraith discusses in his intro-shattering focus problem report and demonstrated below. 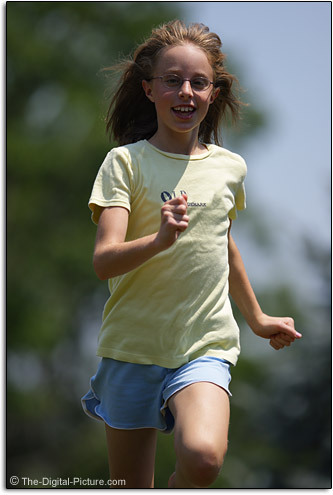 The top-most focus point was used and placed on the girl's face - arms should have had no influence on the result, distance does not seem to matter (this shot is one of the 30-40% in-focus minority). The 1D III AI Servo AF accuracey problem: When using a long telephoto lens on a bright, hot sunny day with an at-least-slightly backlit subject, AI Servo focus accuracy drops to very low. I used a Canon 300mm f/2.8 L IS Lens most extensively during testing but also noticed the problem with a Canon 400mm f/2.8 L IS Lens when shooting soccer under the same conditions. If you must have higher hit rates in these conditions, you should probably keep a Canon EOS-1D Mark II N in your kit until Canon works out this issue. Note: Canon has identified the problem as an AF Mirror issue and has issued a Service Notice. Canon is performing the repair at no charge. If buying a new 1D Mark III, the newly designed sub-mirror assembly should be already installed. On the other hand, the 1D III's extremely fast One Shot AF has been extremely accurate - under nearly all circumstances including the ones problematic for AI Servo. I've had many lenses mounted on this body and have had problems with none of them. Lots of foreground/background detail around the focusing point can fool AF slightly quicker than it does on my 1Ds II, but other wise I am very pleased with One Shot AF. 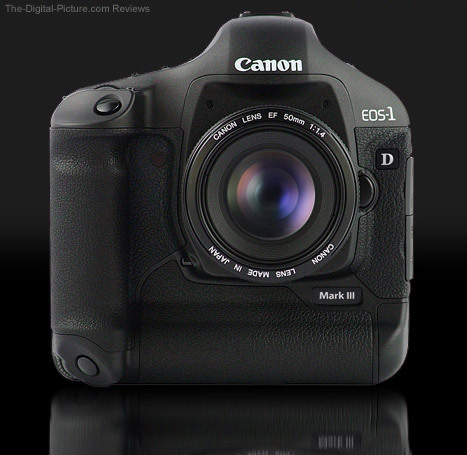 The 1D III retains the standard 45 focus point layout of the 1D II N, but much has changed. You now can manually select only 19 of these AF points, but they are all high-precision, cross-type points (both horizontal and vertical line sensitive) and spread out across the entire AF area. This change took some getting used to, but I have come to like the new design very much. Prior to this camera, I usually used the most-sensitive center AF point only for tracking sports action. But this method could be problematic - if the person was leaning too far forward or arms got in the way, the athlete's eyes would not be in focus. This new design allows tracking with a cross-sensitive focus point located where an athletes head would be framed in a vertical orientation. The other selectable points are proving well-located for my uses as well. I'll gladly trade my 45 selectable points for the more-sensitive 19 (the older 45 point AF clustered its cross-type focus points around the center point as seen above). The center AF point is cross-type sensitive with an f/4 or wider lens while the other 18 manually-selectable AF points are cross-type sensitive when used with an f/2.8 or wider lens. The balance of the points (26) are horizontal line-sensitive assist AF points - able to be used in conjunction with the selectable points or when all points are active. The 1D III's AF system is highly customizable through Custom Functions - you can tune AF to your liking within the many parameters given. For lowlight focusing, the EOS-1D Mark III is twice as sensitive as the EOS-1D Mark II N. "The camera can also detect a grossly defocused subject 1.8 times better than with the EOS-1D Mark II N."
What makes the 1D III an even better focusing camera is its in-camera AF Microadjustment capability. This is an excellent new feature that lets you perfectly focus-calibrate the camera or your lenses to the camera. I see more focus calibration problems than all other camera and lens problems combined. This is a small number of affected products, but you might be surprised at how much the little tweaks you can improve your results. If a camera or lens is significantly miscalibrated, it should be sent in for servicing, but for the rest, I suggest running the lenses through the easy focus calibration procedure. There are many ways to focus calibrate a lens to the 1D Mark III, but they all have the same goal - find the sharpest setting for the combo. Under good light, setup a flat focus target with obvious, contrasting lines/patterns (a newspaper, print, poster or similar printed item will work fine). Lock your camera onto a good tripod at the distance you would be most likely to use the lens at (optimally) and aimed directly at the flat focus target. Get your exposure setting correct at the lens' widest aperture (makes evaluating the test pictures easier). I select center-point-only for my focus point and use the 2-sec self-timer drive mode (optimally with mirror lockup engaged). Then, go into the menu to C.Fn III-7 AF Microadjustment (Custom Function Menu III, function 7). Select "2:Adjust by lens". Then shoot a test shot from a -20 setting to a +20 setting using increments of 5 between each shot. Load the pics into a computer (or review at 100% on the LCD) and determine which 2 settings were sharpest where the focus point was placed. Now shoot the test again using the 6 settings between and including these two settings - adjust by 1 between each shot. You may want to shoot multipple test shots at each setting with the lens defocused to be ultra precise. Determine which setting was optimal and make it the final setting for the lens. Repeat the focus adjustment process for the rest of your lenses. There are a few limitations to the AF Microadjustment feature. First, a maximum of 20 lenses can be calibrated to a camera. The 1D III recognizes a lens by the model (a lens + extender is counted as a separate lens). So, if you have two Canon EF 70-200mm f/2.8 L IS Lenses that you use on the same body, you need to pick a calibration setting that is the best compromise between the two lenses. The AF Microadjustment feature does differentiate between the original, II and subsequent versions of all EF lenses. Since you can only select one calibration setting per lens, you are forced to select the focal length to calibrate to on a zoom lens (Canon suggests the longest focal length as this is the most focus-critical). 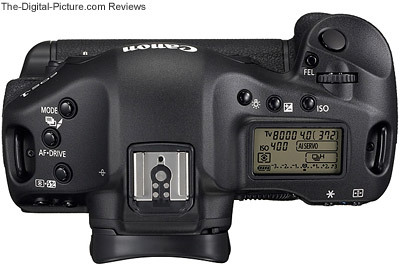 "The EOS-1D Mark III incorporates a newly-developed, 63-zone metering sensor linked to the 19 AF points." Metering seems fine to me - maybe incrementally better, but not a huge difference in the scenarios I've faced thus far. And I use Manual exposure mode most frequently. You will want a big, fast memory card. CompactFlash and/or SDHC (SD High-Capacity up to 32GB) memory cards can be used individually or simultaneously - recording the same or different image format to each. Even though a 1D III file has 60% the number of pixels of the Canon EOS-1Ds Mark II, it has a file size (11-13 MB) that is 80% as large and the 1D III can capture them 2.5x faster. For reference, the 1D II N file sizes are 7-8 MB. The 14-bit (up from 12-bit) 10.1 mp images take some time to empty from the buffer even with a fast card - and will rapidly eat up available card memory. The 14-bit file is a good thing - it yields smoother color transitions - especially when adding contrast/tone curves during post-processing. To take full advantage of the 14-bit file format, you need to shoot in RAW and make all post-processing adjustments before creating a JPG file (8 bit). Output a 16-bit TIFF file for PP work in Photoshop (if not using PS as your conversion tool). * What you need to know about the above comparisons (aside from how to use the mouse-over feature) ... Canon specifies the 1D III viewfinder as having an "approx." 100 percent horizontal and vertical view. In reality, it is somewhat less than 100% (maybe 98%?) - this makes precisely framing a test chart hard as I must rely completely on the zoomed LCD. But, the LCD does not show a 100% view of the final image - cutting about 8 pixels off each edge. For most real world uses, these are non-issues for this camera, but for these comparisons, the 1D III has an approximately .4% disadvantage to the Canon EOS-1Ds Mark II (which also doesn't mean much in the real world). The Canon EOS 30D is at a disadvantage in this comparison as its LCD display only shows about 98% of the final image. Full disclosure finished. The above 100% sample crops were taken under controlled conditions using a Westcott Spiderlite TD5 with 5000k fluorescent bulbs. Identical exposures were manually set - The aperture was f/5.6 and the ISO 400 shutter speed setting was 1/60. The shutter speed was halved for each 1 stop increase in ISO setting. In all three cameras, auto white balance and neutral Picture Style were selected and sharpness was set to "1" - a light but normal real world setting (noise gets sharpened). All images were shot as RAW files, no noise reduction was used. The RAW files were processed to 16-bit TIFF files, imported into Photoshop and output as a JPG using "Save For Web" at a quality setting of 80. Since the 1Ds II has more resolution, I wanted to see the comparison with the 1Ds II image 78% downsized in Photoshop to match the 1D III - thus the additional set of crops. A similar comparison test to the previous. Since low light photography often involves tungsten lights, I wanted a comparison under this lighting condition. The above set of samples were shot under a bare 60w tungsten light bulb and a custom white balance was used - just as I'd shoot in the same real world conditions. Again, sharpening was set to "1" and the Picture Style was set to neutral. An f/2.8 aperture was used for this test. In these tests as well as in real life, I'd give the 1D III an approximately 1 stop advantage/improvement in high ISO noise over the 30D and 1Ds II, though the reduced 1Ds II images are closer in noise level - and uprezzed 30D images would be a little worse. The most notable difference in the sample comparison comes at the upper end of the ISO range. But it does not stop there, this noise advantage is also present in lower ISO shots - especially in shadows when boosting RAW exposure values during post processing. These files are capable of taking large amounts of post-processing adjustment. Another way to look at this - The 1D III essentially makes all of your lenses useful in 1/2 as much light as before. Also noticeable above is that the 1D III blocks are slightly deeper in color. Overall, the 1D III renders colors more richly - a very positive change in my opinion. The 1D III's Dynamic range is great - it holds highlights slightly better than the 1Ds II. In some of the comparisons I shot, the roll-off to blown is a more-smooth transition as well. The 1D III holds highlights much better if the new Highlight Tone Priority is enabled (C.Fn II 3). To use HTP (Highlight Tone Priority), an ISO setting of at least 200 must be selected (which is displayed as 2oo when HTP is enabled). Here is the HTP feature description directly from the manual: "The dynamic range is expanded from the standard 18% gray to bright highlights. The gradation between the grays and highlights becomes smoother." The feature works. It becomes much harder to blow the whites (solid 255,255,255 RGB values). However, it reduces the brightness of the highlights slightly. If you can hold the highlights with HTP set off, you will get crisper images. Highlight Tone Priority will appeal to some photographers and circumstances - especially at weddings where highly reflective white wedding gowns show up next to black tuxes with great regularity. Safety Shift is another new feature designed to keep exposures correct. ISO speed safety shift is provided via C.Fn I 8-2. If the correct exposure cannot be obtained with the P, Tv, or Av mode, the ISO speed is automatically shifted within ISO 100 - 3200 to obtain the correct exposure. Made obvious by the lonesome ISO noise sample blocks on the right in the above comparisons, ISO 6400 is now available (though noisy). I regard the 1D III's ISO 6400 as I did with the 1Ds II's ISO 3200 - a last resort but usable. Think of the what you can do with an f/1.2 lens at ISO 6400. ISO 50 remains available as well. What is responsible for the improved image quality? I'll let Canon address this one ... "At 7.2µm square, the pixel pitch of the EOS-1D Mark III's [CMOS] sensor is identical to the EOS-1Ds Mark II. But the gap between microlenses has been reduced to 0.3µm in the new model, from 0.6µm in the EOS-1Ds Mark II, which translates to the EOS-1D Mark III's pixels having about the same light gathering area as the EOS-1D Mark II or EOS-1D Mark II N, despite the latter two cameras having a pixel pitch of 8.2µm square. 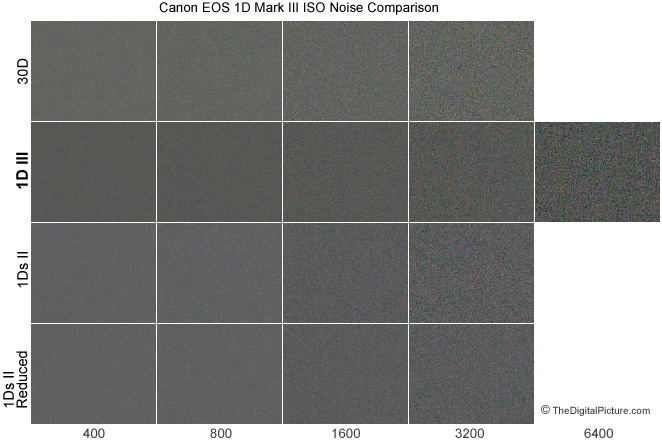 Each pixel's amplifier has been enlarged; this has helped to reduce dark current noise in the EOS-1D Mark III by a factor of 1.33X, relative to the EOS-1D Mark II/EOS-1D Mark II N. Banding noise in the EOS-1D Mark III has been lowered by the equivalent of one stop, also relative to the EOS-1D Mark II/EOS-1D Mark II N. This has been achieved largely through improvements in the camera's firmware. 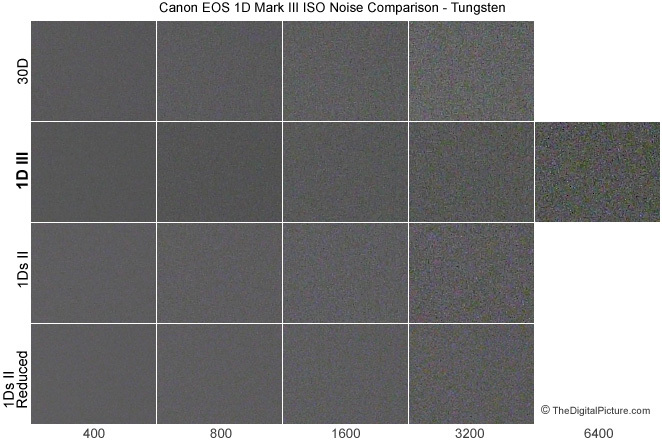 New noise reduction routines are employed in the EOS-1D Mark III's twin DIGIC III processors. The EOS-1D Mark III is the first Canon digital SLR to employ 14-bit analog-to-digital conversion, up from 12-bit in previous models. This means the maximum number of tone steps possible in a RAW CR2 jumps from 4096 to 16,384. This is a contributing factor in the camera's smoother shadow gradations, though not the only factor." The largest feature on the back of the 1D III is the new 3.0" TFT LCD display. It is 1.4x larger than the 2.5" LCD displays on Canon's latest digital SLRs. Unfortunately, the number of pixels remains the same - 230,000. Still, the LCD image quality is excellent - and it is usable at an angle (140° both vertically and horizontally) and even in bright sunlight. The maximum brightness is adjustable over 7 levels to about 1.8 times brighter than the EOS-1D Mark II N's LCD monitor. The new display will make it easier to sell pictures right from the camera - or share the results with a client. I rely heavily on my histogram when shooting. Unfortunately, I can't see the edges of the luminosity histogram in bright sunshine. I can see the shape of the histogram, but I can't tell where I am within the graph boundaries. The fix for this problem seems very simple - illuminate the boundary edges (maybe in red) or the background of the graph. Hopefully a firmware update will attend to this issue. A nice feature is that both luminous and RGB histograms can be displayed simultaneously. Something I don't like is that the 1D III does not remember separate last-used settings for after-shot image review and image playback. I like the image review to show me the histogram and the image playback to show me the full screen image as my 1Ds II is capable of. The 1D III only remembers a single setting. The other firmware v1.0.8 issue was that a fully-zoomed image appeared soft on the LCD. You could not determine from the LCD if the shot was in focus and sharp. Firmware version v1.1.0 has resolved this issue. Shown above is the Canon EOS-1Ds Mark II (left) beside the 1D III. Below shows the Canon EOS 30D to the left of the 1D III. 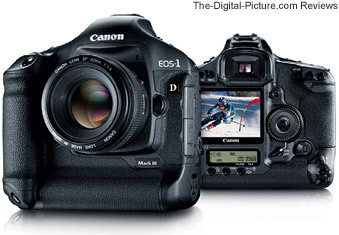 The 1D III now has the ease of use of the 5D, 30D and many other Canon DSLRs. No longer do you have to hold a button down while making setting changes, navigating the menu, reviewing images ... When you press a button, it remains active for 6 seconds - allowing you to make a setting change. This is a much more intuitive design in my opinion. The three buttons on the top left of the camera also accept double pressing. As you can see above, the 1D III now sports a set button in the middle of the rear control dial (like the 30D) - but none beside the LCD (as the 1Ds II has). Also obvious is that the large LCD forced the location change of the rest of the side buttons. Replacing the Quick Control Dial (QCD) on/off switch is a Multi-Controller (joystick) similar to the 30D's. The Multi-Controller is utilized for AF point selection (toggles between center point only and all points active/automatic selection) and is the exclusive method of panning around a zoomed image. I find it faster to use the Main and Quick Control Dials for image panning, but the change isn't a major issue to me - seems it wouldn't be hard to make both methods work (I'd even be willing to hold a button down for this). The switch below the QCD is still a 3-position switch, but the previous AF-beep position feature is now in the menu and the QCD on/off setting replaces it. Also new on the back is the AF-On button for "autofocus with your thumb" or "back button focus". The big button change on top is the addition of a dedicated ISO button. I need to get used to this button position, but it is a nice addition. The top LCD now has a Mirror Lockup enabled indicator. The 1D III's menu has been completely revamped. There are nine menu tabs that cover approximately 40 items - not including the 57 Custom Functions divided into four groups/menu options. After pressing (and releasing) the Menu button, use the Main Dial to select the tab, use the Quick Control Dial to select the option and then press Set (all without holding a button down). One of the new tabs is entitled "My Menu". This menu allows you to place the menu options you use most under one tab. I love it - and use it more than the rest of the tabs combined. Included on my "My Menu" are options such as Mirror Lockup, Format, Battery Info (more later) and Sensor Clean (more later). Shown above are two of the image review/information screens that make good use of the 1D Mark III's new LCD real estate. A new feature enable-able through a C-Fn. is Live View. This feature is similar to what is available on point and shoot digital cameras - you see the 100% image preview on your LCD - before you take the picture. Usefulness is somewhat limited by Live View's MF (Manual Focus) only restriction (the lens AF/MF switch must be in the MF position), but it is a great feature. With Live View enabled and engaged (simply press the set button), frame your pre-focused shot without the camera at your eye - hold the 1D III overhead, over a fence, on the ground ... The LCD will show you 100% of the image to assist with proper framing. Press the DOF Preview button and you will see your DOF and a simulated exposure previewed on the LCD. Using Live View with the camera mounted on a tripod is where this feature gets really useful. Zoom the LCD to 5x or 10x and pan (using the Multi-Controller) to your desired point of focus. Then manually focus the lens to perfection. The LCD applies some sharpening to the 10x image preview, making it capable of very accurate/precise focusing (sharpening halos become slightly apparent on the LCD when perfect focus is obtained). We're not done with Live View yet ... Attach a TV to the camera and preview your shot on the big screen. Attach a computer to the 1D III via the USB 2.0 port and load the included EOS Utility software. Now you see the Live View display on your monitor and have complete control - including exposure and firing - of the camera via the software. Pan to your desired in-focus points using the mouse and adjust the lens focus using the coarse and fine control buttons available - with no camera movement. Better yet, get the new WFT-E2A Dedicated Wireless File Transmitter and control the camera wirelessly. "With the WFT-E2A wireless transmitter, USB 2.0 Hi-Speed external recording media can also be used." Supported media includes USB thumb drives and external hard drives. Live View requires a change of mind set - there is now a new tool available for capturing the perfect/unique shot. The longer I use Live View, the more I like it. There are many, many great applications for it - macro photography is just one. Using a tilt-shift lens is another (they are much easier to focus in Live View). You may have noticed the change in shape of the viewfinder in the comparison pictures. It is new, big and bright - and what you see is what is in your frame. To improve viewfinder magnification, a larger pentaprism is employed. A new line of accessories is also available to fit the new design - Eyecup Eg (with an improved mount), Dioptric Adjustment Lenses Eg (7 types: -4, -3, -2, 0, +1, +2, +3), and Anti-fog Eyepiece Eg. The following table illustrates sensor and viewfinder differences across the current and recent Canon DSLR models. Also noticeable in the top-view comparison picture above is the new flash hot shoe (better visible below). This one should not show paint wear after lots of use - but more importantly, it has a rib that matches up with the weather sealing of the new-at-this-time Canon 580EX II Speedlite Flash and Canon Off-Camera Shoe Cord OC-E3. The 1D III even has the ability to set the 580EX II's custom functions from its own menu options. The 1D Mark III's max X-sync speed is now 1/300 (with EX Speedlites). "For the X-sync contact, the mechanical contact has been eliminated to prevent contact scorching and wear. By employing PR signals for the electronic X-sync contact (a semiconductor switch), reliability is improved. By optimizing the sync timing, an X-sync speed of 1/300 sec. is now attained with EX series Speedlites. With non-EX Speedlites, the X-sync speed will be 1/250 sec., the same as the EOS-1D Mark II N's." The 1D III will be equally sealed around the hot shoe if a 580 EX II is not attached. When a water-resistant EF lens is attached to the camera, the entire camera-and-lens outfit will be water-resistant. 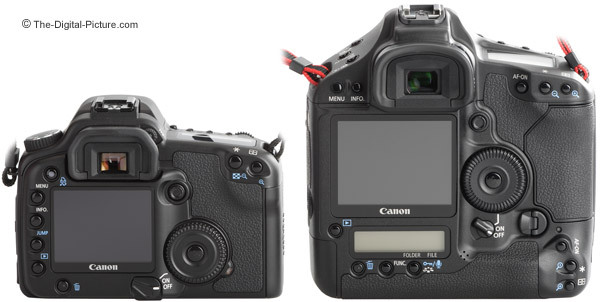 The 1D III inherits the pro-grade build quality of its predecessors. The chassis, mirror box, and exterior covers are now constructed of magnesium alloy - lighter than aluminum but still rugged. 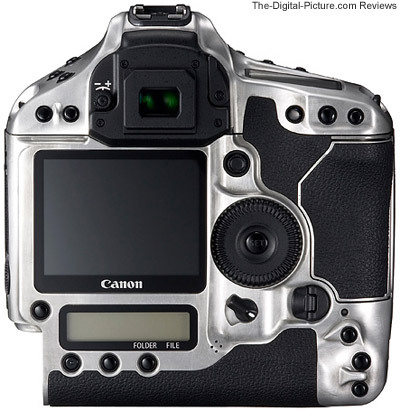 The Canon EOS-1D Mark III incorporates Canon's first "Professional EOS Integrated Cleaning System with Self-Cleaning Sensor Unit" (more advanced than the system deployed in the Canon EOS Rebel XTi/400D). You also remember that I have the "Sensor Clean" menu option on my "My Menu". Yes, the 1D III has Canon's latest self-cleaning sensor, but based on my experience, you are going to need this manual sensor cleaning option at least occasionally. I celebrated when my 1D III arrived with only two small specs of dust (this is good based on my experience), but within 1 weekend of shooting, the camera required a major cleaning. Things have gotten much better since, but I'm only moderately satisfied with this feature at this time. The automatic sensor cleaning is configurable in the menu, but the default 3.5 sec cleaning (indicated on the LCD) at startup can fool your mind into thinking the camera is slow to start up. In reality, it is ready to go in a fraction of a second - you just need to press a button to bypass the cleaning (all Canon DSLRs are shot-priority). Batteries in general are not very exciting, but this one is exceptional. The new Li-ion Canon LP-E4 (above right) is a huge improvement over the prior NiMH 1-Series camera power pack, the Canon NP-E3 (above left). The most obvious improvement is the smaller size (40% less volume) - which comes with a lighter weight (46% lighter - 6.3 oz/180 g vs. 11.8 oz./335 g). This is great, but there is much more. The LP-E4 battery delivered 3,008 shots from the 1D Mark III with 14% battery life remaining on the first charge. This was normal usage that included some Live View shooting (greatly reduces battery life), lots of chimping, lots of IS lens usage, lots of AI Servo focusing ... A subsequent charge gave me 2,433 shots with the same 14% life remaining. 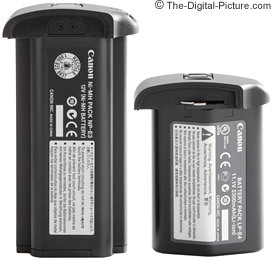 Canon (using the CIPA standard) rates the battery life somewhat more conservatively at approximately 2200 at 23°C/73°F and 1700 at 0°C/ 32°F. The EOS-1D Mark II N was rated for 1200 shots at 23°C/ 73°F or 800 shots at 0°C/32°F. All of these numbers are great in my mind. This battery is also intelligent. The Battery Info menu option (its on my "My Menu") gives you detailed battery information including remaining capacity (as 6-level icon and in 1% numeric increments), shutter count, and recharge performance (3 levels). Also new is that a button press is no longer needed to remove the battery from the camera. It is always a good idea to have a backup battery, but you won't need many spare LP-E4s. Two battery packs can be charged in succession (not simulatenously) the included (and large) LC-E4 charger. It takes about 120 min. to recharge a single battery pack. Need to remember something about a particular shot - such as the names of the people in it? Record an up-to-30 second voice memo using the built-in microphone. The WAV format sound clip will be attached to the image file. See that round black cap just above the battery? This is a cap for the extension system terminal which is used to attach the WFT-E2A Wireless File Transmitter. Make sure it stays tight as many people are losing them - mine was loose out of the box. I've highlighted some of the new and remarkable features of the 1D III, but there is much more to this camera. If you need a feature, it is probably there. At the end of this review, I list many other resources for 1D III information. Canon's 63-page in-depth EOS 1D Mark III white paper is a good place to start - it goes into much greater detail of the huge list of improvements in this camera. As I write this, the demand for this camera is huge - you basically need to get on a list to get one even after over 3 months of its initial release (unless you are willing to pay a huge premium). And I'm not surprised. Canon's 1-Series bodies have consistently been a no-compromise solution featuring top-of-the-line performance in all aspects. The 1D III is no exception. Once you've use a 1-Series body, it is hard to go back. My only reservation with this model is the poor AI Servo AF accuracy under the narrow set of circumstances described earlier - and Canon has changed the AF Mirror Assembly to correct this problem. Otherwise, the Canon EOS-1D Mark III is a big hit. The 1D3, along with an impressive range of available lenses and accessories, is an especially appealing body for sports, photojournalism, wildlife, weddings and other low light photography. At this moment, my primary camera will remain the Canon EOS-1Ds Mark II only because of its higher resolution full frame sensor. But, I'm waiting anxiously for a Canon EOS-1Ds Mark III that incorporates the same improvements.